Domesticated: While Megalosaurus is not the most powerful theropod, it is still highly sought after by night-raiders. Due to its nocturnal nature, Megalosaurus becomes much more formidable at night — dodging attacks, conserving stamina, and attacking more accurately, to name a few of its enhanced talents. 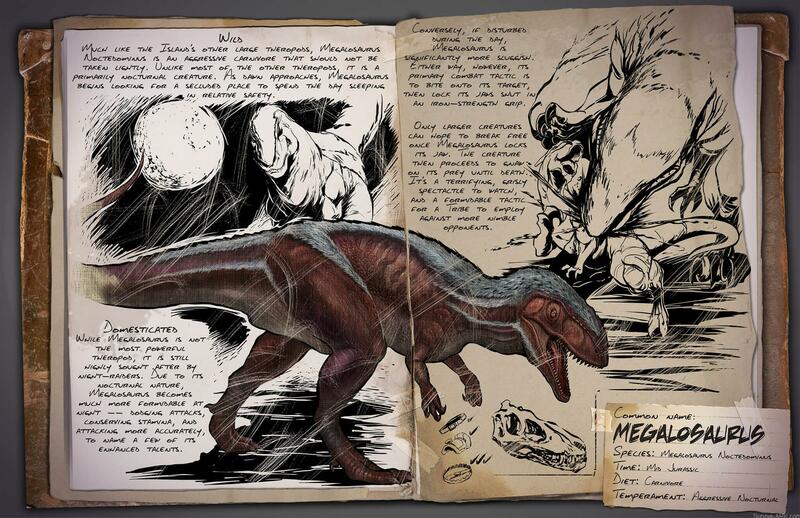 The dossier states that the Megalosaurus will endure a boost at night, since it is a nocturnal creature. It can conserve stamina, dodge attacks more easily and attacks more accurate when it is night, but there could be even more enhancements when the creature is actually released. This will create a much more dynamic gameplay, as the creature is different depending on the time of day. We’re excited to see how this is going to be implemented and if more creatures will be affected by the day/night cycle in the near future. Previous Post: Upcoming dinos preview – Giant Beaver, Dung Beetle, Terrorbird and more!